One of the questions about open source software people have frequently asked is: how can it possibly work? Thousands of people on a volunteer basis, coding only when they feel like it, working on a project that doesn’t even carry their own name–it should never work. It should not only fail, it should crash and burn quickly. Yet projects like Linux and Emacs prove that such a system not only works but also that it works well–often times far better than the commercial tradition of hierarchical development. Eric S. Raymond asked himself how this could possibly be. He went further, however. He not only asked how it could work, he tried to make it work himself. 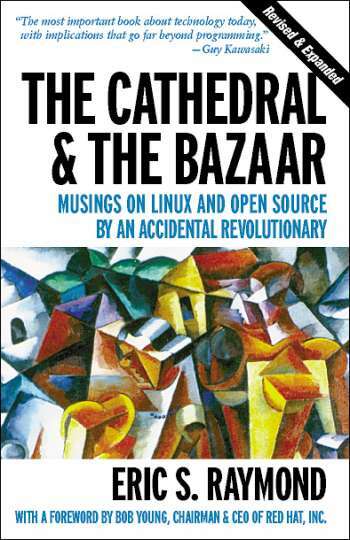 The Cathedral and the Bazaar is Mr. Raymond’s account of that project: the building of the fetchmail program. What Mr. Raymond found was a set of guiding principles–ultimately nineteen aphorisms–for guiding open source development. Some are specific to developing software–or so it would seem. With a bit of imagination, however, one can extrapolate many of the principles to other contexts. In particular, I have often mused that the participatory model of open source software development can work on some level for participatory government as well. The idea that “Given enough eyeballs, bugs are shallow” has a possible implication in local governance: for instance, if many citizens had a clear and direct look at civic policy, certain flaws in governance would eventually become obvious to someone, who could then propose a fix–even if that person could not implement the fix alone. True to the open source idea of development, Mr. Raymond’s book went through a constant series of upgrades and version numbers between its initial presentation at the Linux Kongress of 1997 until his most recent “stable version” in 2000. Download the EPUB version of The Cathedral and the Bazaar here.